Following are the official guidelines for participating in the SCVA Regional Honor Choir for 2018. Please read all information carefully before applying to audition. What is SCVA Regional Honor Choir? 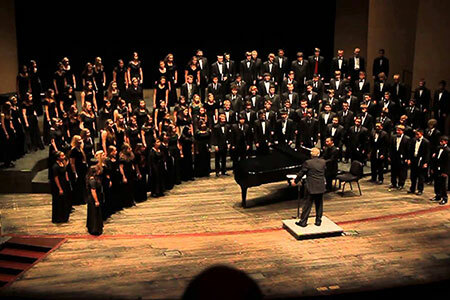 270 outstanding choir members will be selected from approximately 600 auditionees to sing in one of three choirs: Women's, Men's or Mixed Honor Choir. Singers will receive a packet of music and rehearsal tracks, and then (with music memorized) come together on Thursday, Friday and Saturday, November 15, 16 & 17 at University of Redlands for three full days of intense rehearsals culminating in a Saturday evening concert. All deadlines are firm and WILL NOT be extended, and the guidelines CANNOT be altered. Keeping strict deadlines allows your students and our staff the greatest amount of time to prepare for the Honor Choir rehearsals and performance. The performance is open to the public. General admission tickets are $10.00 each may be purchased using the presale order form, on-line, or at the venue on November 15, 16 and 17. Tickets usually sell out, so get your tickets early!! All students in Southern California should use the online application on the SCVA website. DO NOT use the ACDA application from the California ACDA website, as the Regional Honor Choirs in Southern California are solely administered by SCVA. Confirm you are available for all dates as listed above. If you are selected you must participate in all dates or your school may be suspended for one full year from Honor Choir. Enter all student information and select the desired audition site in the on-line form. Please register early for the best availability. Once an audition site fills-up, it will no longer be available for selection. The student must also accurately enter his/her director's e-mail address. The director's SCVA Membership must be current. In addition, students should indicate if their audition should be "Considered for the All-State Honor Choir". No other audition is necessary. After clicking on the "Submit Application" button, the student can use PayPal to pay the $10.00 audition fee using any major credit card. See "Fees" below for other options. Students will not be given an audition time if payment is not received by Sept. 15th. An automated e-mail message will be sent to the director for each student who applies. The e-mail message will include a link to a special web-page that allows the director to see a list all of his/her students who have applied, and allows a selection of "Approve" or "Reject" for each student. The first time the director approves or rejects a student's application for the current Honor Choir cycle, an additional form allows the director to indicate, review, and/or change contact and school information. The director's information is then stored for each new applicant (Information from directors whose students participated last year was previously stored). All choral directors must be current members of SCVA, and their membership dues must be paid. IMPORTANT: The Participation Fee is only required for those singers who are selected for one of the Honor Choirs. DO NOT pay the Participation Fee until the Audition Results are available. IMPORTANT: Many of these audition sites fill-up quickly, so you are encouraged to submit your Audition Application as soon as possible. If a specific audition site does not appear in the list of selectable audition sites, then that site is already full and no further applications can be accepted for that location. No additional time slots will be allocated for an audition site that is already full. Instead, you must select an alternate audition site. We recommend that students and teachers review each of these skills so that all singers are well prepared. The singer will sing the song once through with no repeats or da capo. Each singer must provide an accompanist or recording. Sites have been asked to have CD players with a plug in for iPods and phones available for student use. Singers must provide two copies of music for the adjudicators. The key selected for the solo is up to the singer and is not dependant on indicated voice part. TONAL MEMORY: (25 points) Five-note passages will be played on the piano for the singer to repeat, sung on any syllable. SIGHT-READING: (20 points) A single-line, unaccompanied melody will be supplied, sung on any syllable. Humming during preparation is permitted. SCALES/TRIADS: (15 points) Sing the following ascending and descending: major scale, major triad, minor triad, and chromatic scale, sung on any syllable. Singers will be selected for SCVA Regional Honor Choirs participation according to the raw scores received at the time of audition. Audition results for all choirs (Men's, Women's and Mixed) will be posted on the SCVA website by October 6th. If you are new to honor choir this year, upon acceptance, you will be randomly placed into one of the SCVA Honor Choirs, and if applicable, into the All-State Mixed, Men's or Women's Honor Choir. Singers who sang in a Regional Mixed Honor Choir last year will be placed into the Regional Women's or Men's Honor Choir this year. Singers who sang in a Regional Women's/Men's Honor Choir last year will be placed into the Regional Mixed Honor Choir this year. Singers are then sent a packet of music and practice tracks for learning their music. There is only approx 10-14 days from when results are posted and the first rehearsal. Directors: Please make sure that all singers understand policy before they audition. They need to make intelligent, committed choices about their involvement in the honor choirs. All students auditioning for SCVA Regional and California All-State Honor Choirs must be members in good standing with their school choral program and their conductors must be paid members of SCVA. Teachers may pay their dues online or by contacting the SCVA Vice President of Membership. A student must be enrolled in his/her school's choral program in order to be eligible for participation in Honor Choir. If a student drops out of the school program, he/she will be dropped from Honor Choir as well. No sanctions will be imposed on the school in this case. When a student drops out of an SCVA Honor Choir or does not attend rehearsal, the student's school is subject to suspension from Honor Choir the following school year. The SCVA board makes the final determination regarding the one-year suspension of the school after reviewing the situation and consulting honor choir policy. Given our time constraints, when a student drops out of Honor Choir it is impossible for us to fill their vacancy. Therefore, when a student drops out, another deserving student misses out on this wonderful opportunity. Students who must, out of extreme necessity (such as death in the family or serious illness) drop out of Honor Choir after being accepted are required to provide a signed, written note from their parents and from their school choral director stating the reasons for the drop out. The note MUST be sent immediately to the Honor Choir coordinator by mail, email or hand-delivered by the student, parent or director. Schedule conflicts of any kind, such as an athletic event, drama or choir rehearsal or performance, SAT, transportation issues, a student deciding he/she would rather not participate, doesn't like the music, or doesn't want to work with a particular conductor. If a student drops for any reason, a panel of members from the SCVA Board will consider the reason given and decide whether it is an unacceptable or acceptable reason. Choral directors are responsible for remaining informed about their students' continued participation in the Honor Choir. A serious medical problem, or other matters of an equally serious nature. Students are responsible for their own transportation, lodging and meals. Hotel reservations and payment for honor choir participants are the responsibility of the singer's director/chaperone and are to be made directly with the hotel reservation personnel. Singers who are registered at a hotel must have someone over the age of 21 register the singers on-site. This is a hotel rule and is non-negotiable. All singers must be chaperoned regardless of age. All Directors are encouraged to help at the Honor Choir weekend in November. Any Director with two or more students in Honor Choir is expected to help on one of the two weekends. Student's SCVA Regional Honor Choir scores are sent to ACDA immediately after the Regional Concert. California ACDA administers All-State Honor Choir. Members of the All-State Honor Choir are chosen from the top scores of the Northern, Central and Southern Regional Honor Choirs singers. Announcement for All-State admittance comes in December after the Regional Honor Choir concerts. If students checked that they are interested in being considered for the All-State Honor Choir they must be available for the All-State weekend on March 14-16, 2019 in San Jose. See the California ACDA Website for Guidelines and Policies. Singers who desire to be considered for the All-State Honor Choirs need only mark the appropriate box on the SCVA Regional Audition Application form. Singers will be asked at their auditions and during Regional Honor Choir weekend to reconfirm their interest in the All-State Honor Choirs. Singers will be selected for the All-State Honor Choir according to the raw scores received at the time of the initial Regional audition process. Singers who sang in the All-State Mixed Honor Choir last year will be placed into the All-State Women's or Men's Honor Choir this year. Singers who sang in the All-State Women's or Men's Honor Choir last year will be placed into the All-State Mixed Honor Choir this year. A student's school will be subject to a one-year suspension from All-State Honor Choir if a student is considered, accepted, and misses any rehearsals or the performance at the All-State event. PayPal - preferred method of payment at SCVA website; Students may use any Major Credit Card on PayPal for a $0.55 processing fee. If you are selected for one of the Regional Honor Choirs you may pay the $90.00 fee via PayPal in advance of the rehearsal weekend on the PayPal site or bring to the first rehearsal. However, do not pay the $90 Participation Fee until you know that you have been selected for one of the Honor Choirs.